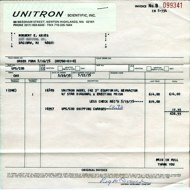 A discontinued product line, posted for information purposes by Company Seven and with a historical perspective about the company who made it. 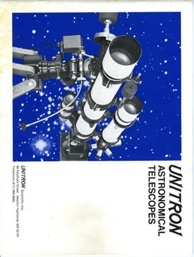 The Unitron telescopes illustration here and the literature hosted are from Company Sevens archives and exhibit of telescopes. These telescopes and most of their accessories were manufactured by Nihon Seiko Kenkyusho, Ltd. based in Tokyo, and its subcontracted vendors in Japan. The company was established at least as far back as the the mid 1930s, then furnishing fine achromatic refracting telescopes, based on the Carl Zeiss type E air-spaced doublet achromat lens design, of at least up to 125mm aperture under the POLAREX or SEIKO SCOPE trade names. By 1951 the company had emerged from the ashes of the war and offered their initial assortment of what was to become an extraordinarily well integrated and comprehensively accessorized line of telescopes and mounts. The Nihon Seiko telescopes were marketed in most major markets and under several trade names until the discontinuation of routine telescope production in 1992. Above Right: Nihon Seiko in Japanese Kanji script. The first two characters translate to Nihon meaning Japan, and the other Seiko for success (54,097 bytes). Distribution History: the distribution of these products overseas was managed by independent distributors selected by Nihon Seiko. 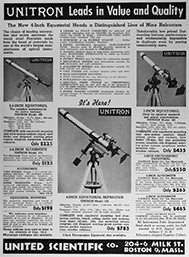 In the Fall of 1951 the United Trading Company (hence UNITRON) based in Massachusetts commenced marketing the telescopes in the USA. For most other countries they were marketed under the trade marks POLAREX or POLAREX. Harrison Scientific on rue Sainte-Catherine in Montreal also marketed these in Canada as POLAREX. The same trade name applied for the Netherlands, Belgium, and Luxemburg (the Benelux countries) where they were sold by retailers including Bhillen Foto of Arnhem, and Polaris in Amstelveen and Antwerpen for example. The telescopes were marketed similarly in France and several other countries in Europe. In Germany these were marketed from the early 1960s through the Spring of 1985 as UNITRON by Manfred Wachter Präzisionsmechanik und Optik of Bodelshausen at Tübingen (near Stuttgart), whose well illustrated literature remains a good source of information about these products even today. In the mid 1980s these were distributed by Neckermann AG based in Frankfurt, Germany that sold these bearing the trade name WELTBLICK (World View). From the mid 1960s to 1971 Eric Nordquist, owner of Astroniks, marketed these telescopes in Sweden trademarked SEIKO SCOPE or POLAREX. Bjorn Hedvall operated Meridianrefraktorerna in Göteborg Sweden selling these telescopes between 1972 well into the 1980s trademarked MERIDIAN. Hedvall remains particularly well regarded in Sweden for his work to promote the public interest in space and the Slottskogsobservatoriet (Castle Forest Observatory). You may also find some of the smaller Nihon Seiko telescopes such as the Model 114 bearing the trade name Beli (Beli) and these may have some components (Lens Cover, etc.) labeled Seiko Scope or stamped with the letters N.S.. In Australia these telescopes were distributed as POLAREX by E. Esdaile and Sons Pty. Ltd. in Glebe, a suburb of Sydney, until 1962. From the mid 1960s until the demise of the product line these were marketed as UNITRON by Eric Witcombes Amateur Telescope Supply Company (in 1973 changed to Astro Optical Supplies) in Crows Nest, also a suburb of Sydney. While the smaller aperture telescope models in particular were marketed under the less well known trade names, including MERCURIUS in parts of northern Europe, eventually UNITRON became the most well-known of the trade names. 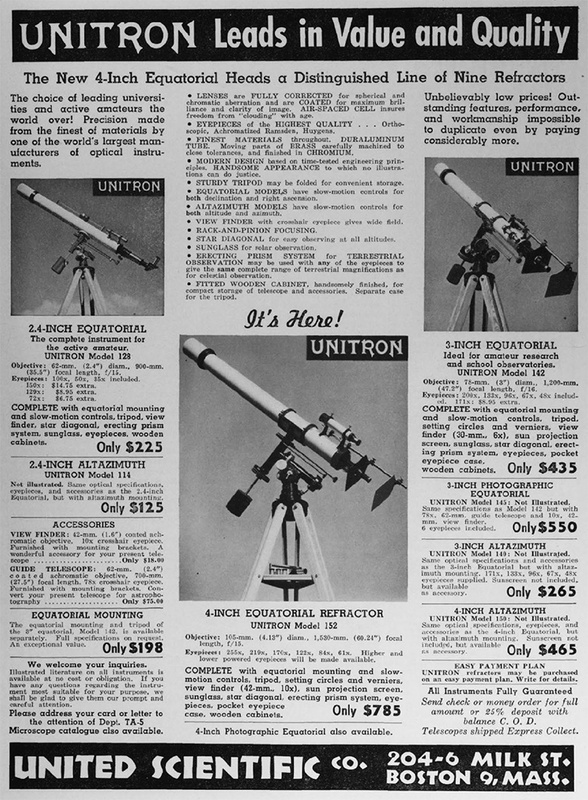 This was due in no small measure owing to the proliferation of marketing advertisements in numerous astronomy publications by Unitron USA companies, and the prevalence of Americans visiting and residing for their work in many first world countries where there was interest in astronomy and the sciences and where these could be successfully marketed. 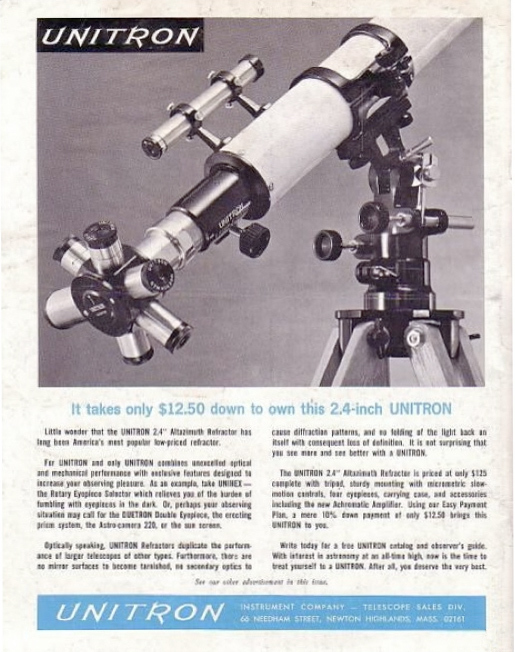 The name became well enough recognized that by the early 1970s telescopes bearing UNITRON were being sold even in Japan. One cannot rely on the presence or absence of a trade name, particularly POLAREX or UNITRON, to determine where the instrument was originally sold. Particularly in times of high demand or of dwindling stock, Nihon Seiko could send whatever they may have had readily available to a distributor in need regardless of the trade name or possibly even the lack of any trade name at all. To add to the confusion for historians, the instrument optical tubes and mounts too bear no model designation. So it is difficult to know not only where it was originally sold, but also how it was originally configured. For example consider the Model 132 4.0" Equatorial Telescope, this is shown in the oldest Nihon Seiko catalogs. 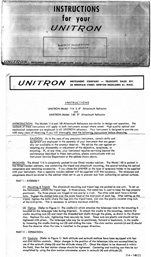 The Model 132 was marketed in Asia and Europe as well as in many other countries, typically under either the UNITRON or POLAREX trade names. The Model 132 was not marketed in the U.S.A. however, a similarly configured version was marketed there, and in Australia, even later in Japan, and in some other countries too as the Model 152 4.0" Achromatic Equatorial Telescope. Other than the difference of their focusers, none has any markings to distinguish the Model 132 from the Model 152. Even the present configurations cannot be relied upon to determine the history. Consider the range of latitude adjustment of an equatorial mount head does give away something about where it may have been most recently used, but this cannot be relied upon to prove where it was originally sold. In the years following the original sale the owner could have changed out any of the components that might have pointed to the instruments origin. 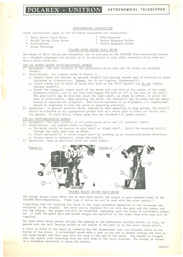 The owner of telescope mount being relocated from the U.S.A. to Germany would have had the Latitude Adjustment nut exchanged to facilitate Pole Alignment at the higher latitude, so you may find an originally configured Model 152 telescope in Germany where the similar Model 132 was being marketed. The optical tube assembly of a Model 150 4.0" (with the Deluxe Focuser and sold with the Alt-Az mount) might have later been mated to the German Mount, in effect ending up with a Model 132 for example; so finding this telescope in someones basement here would not prove the Model 132 per se was ever marketed by UNITRON USA. So we at Company Seven reconstructed the history of these product lines by the study of instruments that remain in custody of their original owner, or that are accompanied with their original sales invoice or some other documentation. Locating the Trademark: the telescopes bear their trade name on the front ring of the Lens Cell and on the right side of the Focuser body, and on some of the accessories too. This is engraved and this filled in with white paint. But there are instances too where focusers and many accessories too (motors for example) simply bear a stick-on trade name label. The telescope mounts bear no trade name though some of their accessories, the motor housing for example, will bear the trade name and/or a N.S. mark. Unfortunately the mounts as well as most optical tube assemblies bear no visible serial number, this makes it difficult to research the history of or verify individual telescopes. Right: Unitron and Polarex 4 inch telescope objective lenses and cells (69,784 bytes). In Company Seven archives (68,308 bytes). Polarex and Unitron telescope optical tubes were painted a traditional white with black front and rear cells, black mounting collar and accessory mounting brackets. While Meridian and Weltblick telescope optical tubes were painted white or a shade of distinctive blue, with the other components black. 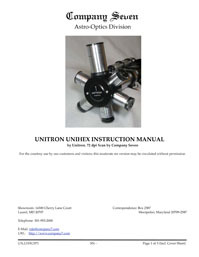 Hence the identical telescope models might be found bearing the UNITRON logo, while another bears POLAREX for example. Weltblick branded telescopes typically had their trade name engraved on the lens cell as do the Unitron and Polarex models. The Welblick telescopes may bear the letters N.S. (made by Nihon Seiko) engraved on the side of the focuser opposite the WELTBLICK trademark. 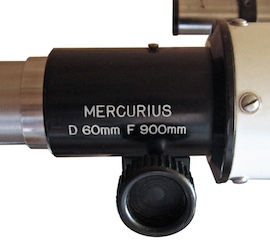 The focusers of smaller telescopes will have a Weltblick branded stylized eye sticker and model designation sticker below that on the right side, with a N.S. sticker at the bottom of the focuser body. Some of the Weltblick accessories too, including the finder telescope and the provided eyepieces, were similarly engraved or may only bear an N.S. sticker. Above left: Weltblick 'Eye' logo sticker, as found on their telescopes focusers. From Company Seven archives and exhibits (51,188 bytes). To add to the complications of determining the origin of a telescope, Nihon Seiko and many other makers of telescopes components in Japan at times sold components (focusers, finderscopes, lenses, optical tubes, mounting hardware, etc.) to each other, or even to telescope parts integrators overseas. So a Nikon Seiko focuser might have been furnished on a Brandon telescope, or other that you may never have heard of. Or what was sold new as a Unitron telescope may have later been retrofitted by the owner with a new or used Polarex objective lens and cell. The stick-on label of a focuser, or the entire focuser could have been exchanged for convenience by a collector who wanted an all-Unitron or all-Polarex instrument for example. 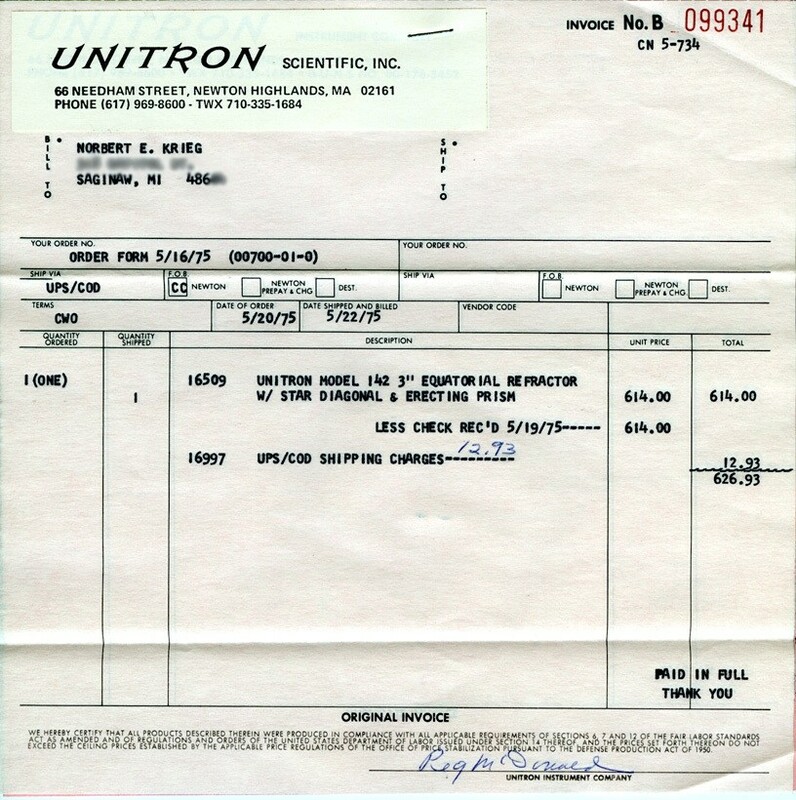 Nihon Seiko eyepieces, whether labeled UNITRON or UNITRON, or POLAREX or N.S., or nothing at all may have been manufactured by some other company in Japan. This was not uncommon since no telescope maker could manufacture every item from scratch in their shop. These elegant telescopes came to epitomize all that was great about traditional achromatic refractors - and all their shortcomings too. But these remained the class of well made telescopes that many purists, who could afford them, aspired to own and use. These remained in production and with very few changes from 1952 through 1992, by then these optical dinosaurs had been displaced from the marketplace by the more recently developed superior and more versatile apochromatic telescopes. These telescope inspired awe and the imagination among those of “The Greatest Generation” and of their “Baby Boomers” and as such these rightfully deserve our respect, and their place on public display in Company Sevens collection preserved here (hopefully) for generations to come. For more information about the history of Nihon Seiko and these products, details of their marketing, construction and specifications refer to the following articles. 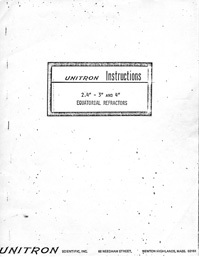 Unitron Model 114 - 2.4" (60mm) Achromatic Telescope Illustrated article describing an original Unitron 2.4 inch (60mm) achromatic refracting telescope. This was sold as the Model 114 with altazimuth mount with tripod, and its accessories. This article also goes into the history of Unitron telescopes and of the industry over the years when Unitron was selling telescopes. From Company Sevens Museum Collection. Unitron Model 142 - 3.0" (75mm) Achromatic Telescope Illustrated article describing an original Unitron 3 inch (75mm) achromatic refracting telescope with German Equatorial mount with tripod, and its numerous optional accessories. 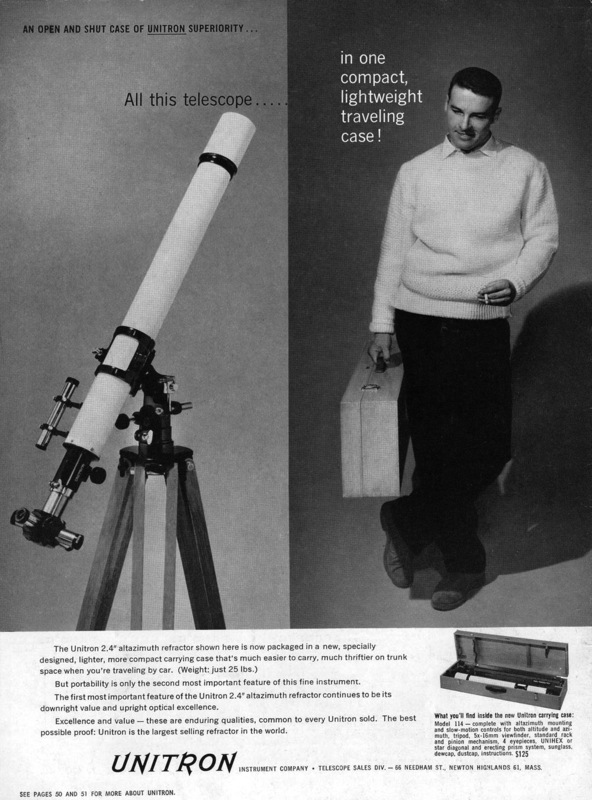 In fact this telescope is so well accessorized that it actually surpasses the equipment level as provided with the Model 145 as those were sold. This article also goes into the history of Unitron telescopes and of the industry over the years when Unitron was selling telescopes. From Company Sevens Museum Collection. Unitron Model 132 - 4.0" (102mm) Achromatic Telescope. Illustrated article describing an original Unitron 4 inch (102mm) achromatic refracting telescope with German Equatorial mount with tripod, original wood cases, and its numerous optional accessories. The instrument we exhibit was marketed overseas as the Model 132, while a version similar to this was marketed in the USA as the Unitron Model 152 telescope. This particular telescope was among the last production Unitron telescopes, sold in the early 1980s and with a distinctive multi-coated objective lens and uncommon folding wood tripod legs. This was acquired by Company Seven in an amazingly complete configuration, in near new condition from Xavier Debeerst, a collector and amateur astronomer in Belgium who owns the Arcturus Observatory and Anamorfose Curiosa. This article also goes into the history of Unitron telescopes and of the industry over the years when Unitron was selling telescopes. From Company Sevens Museum Collection. Throughout August 2014 the set (shown at right) was cleaned and documented, then prepared for permanent exhibit in Company Sevens showroom. This article was made available after our extensive examination and documenting of the telescope set were completed; this required several weeks to complete and is among the more comprehensive we have written about any instrument in our exhibit. This exhibits an original 220 volt AC (European) electronic motor drive, a mechanism that allows the German Equatorial Mount to automatically track celestial objects, compensating as the Earth rotates. In June 2015 through the kind assistance of Mr. Albert Carcich of New Jersey, we acquired a UNIBALANCE Counterweight Set that appears as new and with original carton; this has since been installed onto our Model 132 telescope exhibit. Right: Unitron Model 132, a 4 inch telescope with German Equatorial Mount and wood tripod sold new in Germany, acquired in 2014 for permanent static exhibit at Company Seven (89,245 bytes). Note the originally provided Sun Projection Screen set was not unwrapped and installed for this photo, it remains packaged in its original wrapper within the OTA storage case. Unitron Model 152 - 4.0" (102mm) Achromatic Telescope. We are preparing a new illustrated article describing an original Unitron 4 inch (102mm) achromatic refracting telescope with German Equatorial mount with tripod, original wood cases, and its numerous optional accessories. This instrument was sold new by Unitron USA while this model was also marketed in several countries overseas as the Model 152. The Model 152 are quickly distinguished from the Unitron Model 132 - 4.0" (102mm) Achromatic Telescope (above) by their standard 2 inch diameter Super Focuser. This telescopes mount includes the fixed-length wood tripod legs as were standard with most 4 inch models sold since 1953. This particular telescope was among the later production Unitron telescopes, purchased new by Mr. Rick Johnson in 1975 but rarely used owing to its size. This set was acquired by Company Seven in an amazingly complete configuration, and in near new condition and is now on exhibit. We are grateful to Mr. Johnson whose preference to see this exhibited for the public at C7 allowed us to acquire this instrument under generous terms. As does our article about Unitron Model 132, this new article too will explain the history of Unitron telescopes and of the industry over the years when Unitron was selling telescopes. From Company Sevens Museum Collection. The telescope arrived at Company Seven on 10 July 2015 and is being documented while it is on permanent exhibit in Company Sevens showroom alongside our Unitron Model 132 4" telescope for comparison. A new article explaining this telescope will be available after we conclude our examination and documenting of the telescope set. In time we hope to acquire for this exhibit an original Unitron weight-driven Clock Drive. This was the optional clock mechanism geared to allows the German Equatorial Mount to automatically track celestial objects as the Earth rotates; these were often replaced by more precise and controllable electronic motor drive sets as our Model 132 and Model 142 - 3.0" (75mm) telescopes have however, the mechanical clock has a greater aesthetic appeal, and having one on exhibit would demonstrate how the early German Mounts were equipped to track in the days before electricity became available. 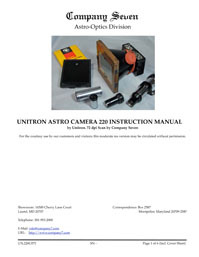 Polarex/Unitron Model 220 - ASTRO-CAMERA Illustrated article describing an original sheet film camera designed for 9 x 12 sheet film and made for Nihon Seiko by HANSA specifically for astrophotography, but also capable of terrestrial work with these telescopes. From Company Sevens Museum Collection. 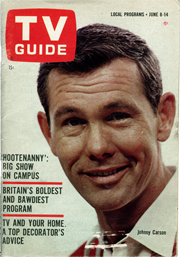 "The Green Lights Are Flashing For Johnny Carson" article by Gilbert Millstein with photograph by Curt Gunther in the 8 June 1963 issue of the weekly TV Guide Magazine. The late Johnny Carson came to the hobby of astronomy and accumulated several telescopes including the Unitron Model 114 2.4 inch Achromatic refracting telescope. 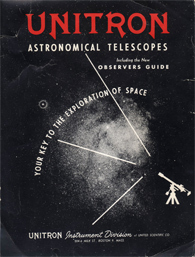 In this interview Mr. Carson was shown in only one of the several photos taken alongside his Unitron telescope by photographer Curt Gunther. Over his tenure as host of “The Tonight Show” and in other ways he popularized the science of astronomy. He was formally recognized by the professional astronomy community when the asteroid 3252 Johnny was named after him. 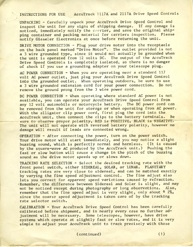 This is the scanned copy of original magazine* in Company Sevens Archives. This article is protected by Copyright. We obtained permission from TV Guide Magazine, LLC to scan and host this article from the original in our archives for the benefit of our readers and for display alongside the Unitron 114 in our museum collection. Please do not distribute this without permission. 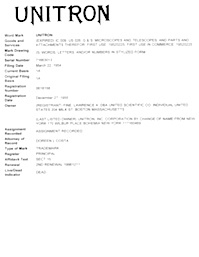 Download size is 5,675,333 bytes (an Acrobat ".pdf" file). Click here to download it free from Adobes web site.